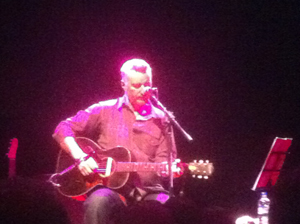 There are few contemporary artists who have had more profound an effect on me than Billy Bragg. From my first hearing of songs like Milkman of Human Kindness and New England back in the eighties, right up to his work with Wilco on the Woody Guthrie project, my faith has been almost unshakable. Through his politics and his heartfelt observances of the human condition, his songs have resonated within me. The album Workers Playtime sits firmly in my all-time top ten list regardless of when, or by whom, I am asked. I've seen Bragg play a number of times, but not for a few years. The last couple of performances I have attended have featured full-band arrangements, which have been very enjoyable, but I generally prefer the stripped down line-up of Billy Bragg and his guitar. I arrive at the Astor Theatre and am immediately put offside when the usher takes, and keeps, my entire ticket. No souvenir there, then. The auditorium is spacious and airy, largely due to the fact that the bulk of the audience appears to prefer the seats in the back half. I stand, about ten metres from the stage, and await the performance. Jordie Lane kicks things off and his short set impresses me. I know his name, but am almost completely ignorant of his music. I make a mental note to remedy this. The expected, and usual, half-hour of enforced boredom between support and headline sets is eschewed, and almost more quickly than I can say "in a perfect world we’d all sing in tune", the Bard of Barking appears to generous applause. As he sips his mug of tea, Bragg lets us know how the evening is going to go. Two sets, one spotlighting the music of folk legend Woody Guthrie, the other featuring highlights of Bragg's own musical career. He'll sit down for the folk set, and stand up for the rock and roll. Righto, let's get started then. Although the Guthrie retrospective is introduced as being a ‘warts ‘n’ all’ exposition of the man and the minstrel, it is actually an affectionate, humanistic remembrance. Guthrie's lyrics have been set to music with care and delivered with respect, and the tales of the Dust Bowl Troubadour's life are warming. Some of the songs seem very much like Woody, others more like Braggy. Either way, it’s a pretty strong set. The second half of the show sees Bragg doing what I think he does best - being Billy Bragg. As much as I like Woody Guthrie, this is what I was waiting for. The classic songs come thick and fast, demonstrating once again the worth of Bragg's canon. Strapping on the Telecaster, he launches into The Price I Pay from the aforementioned Workers Playtime and we are away. Hits such as Sexuality, Greetings To the New Brunette and Levi Stubbs' Tears are complemented with new songs, lesser-known numbers, and some belting album tracks. High points include new song Scousers Never Buy The Sun, Sin City (with Jordie Lane), I Keep Faith and the sublime Tank Park Salute. But there’s so much more besides. At 54 years' old, Bragg has probably mellowed slightly, bringing anecdotes of family life and fatherhood into the mix, but there are still plenty of points to be made about the things he considers to be the important political and social issues of the day. They are his views and, although the audience is largely in accord, there are some who grow slightly weary of the talk and make it clear that they would prefer to hear some more music. Despite the sometimes overlong and well-rehearsed introductions and ad-libs, I still value the worth of the artist who is willing to engage his or her audience. After a generous performance, Bragg finishes the evening with an updated and raucous Great Leap Forward, and follows with crowd-favourite New England (dedicated to the late Kirsty McColl). As the last strains of New England fade into the ether, Billy Bragg puts down his guitar, salutes, throws his tea bag at me, and leaves the stage. He’s promised not to leave it too long before he revisits. I hope that is true.